The Mimo baby monitor - the world's first "smart onesie"
Here’s the latest in wearable baby monitors, this one is marketed as the world’s first “smart onesie”. We’ve featured a raft of high-tech baby monitors of late, including the Owlet Vitals Monitor and Sproutling – both of which attach to a baby’s leg. The Mimo Baby Monitor has gone one step further and incorporated a monitor into baby clothing. This monitor created quite the stir at Intel’s CES booth this year, and we can see why. The Mimo organic cotton kimono is fitted with a non-contact, machine-washable sensor, that measures a baby’s respiration. When it’s used with the Mimo Turtle it monitors the baby’s respiration, skin temperature, body position and activity level. The data is then sent to the Mimo Lilypad Base Station, using infant-safe Bluetooth Low Energy. The Mimo Lilypad connects the Turtle to your home WiFi, which means the information is processed in real-time. The Lilypad also has a microphone, so the Mimo can stream baby’s sounds to a smartphone in real-time. 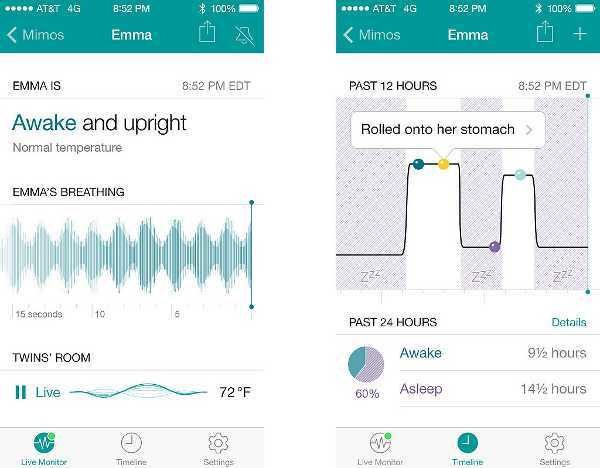 The Mimo app means the baby’s carers can see the baby’s data in real-time, set alerts so they’re warned if anything changes, and view trend and analytics about their baby’s sleep over time – how impressive! And the app is compatible for both iPhones and Android devices. Mimo has been designed and is manufactured in the US. The Turtles are water resistant, large enough not to be a choking hazard and chew-safe. The Mimo starter pack costs US$199, and includes three Mimo kimonos, one Lilypad Base Station and one Turtle. The packs come in three sizes, newborn to three months, three to six months and six to twelve months. There was some indication at CES that coffee mugs which can receive data would also be available (pictured below) but there’s no indication of when they may be on sale. The Mimo pre-sale orders are full, but you can sign up to find out when more will become available.